(CBS) - Good news for all the party animals out there: the University of Pennsylvania has cleared it's Zeta Psi fraternity of camel abuse allegations. 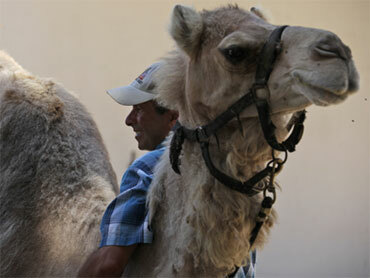 The allegations reportedly stem from an April 15 party at which the camel was one of several hired animal guests. The Spring Fling was appropriately petting-zoo themed . Trouble began after a student photographed Kahn the camel lying on the ground with several young women holding plastic cups standing around him. The photographer, postdoctoral fellow George Leslie, then distributed it to media outlets and wrote a letter to the Daily Pennsylvanian accusing the party-goers of "exploitative and thoughtless treatment, if not animal cruelty." Adding insult to the injury, Leslie, 42, called the party "a terrible scene" filled with "loud music and drunk college students," according to philly.com. A college party with loud music and drunk students? Well, I never! Charis Matey, the animal's owner, has denied that the animal was mishandled, and the university found no evidence of abuse or wrongdoing after an investigation, reports philly.com. The owner says Kahn the camel has been rented to Zeta Psi five times in the last 5 years without incident. Matey also reportedly says the allegations were uncalled for. "It was a fun day. The students were wonderful. Nothing happened," Matey said. "Then some moron took a picture of the camel lying down eating hay, with some girls standing beside him." No word yet on whether Leslie will be invited to the next Zeta Psi party.